Summer is a great time to try family camping for the first time. With proper preparation, family camping can be a great experience for all. 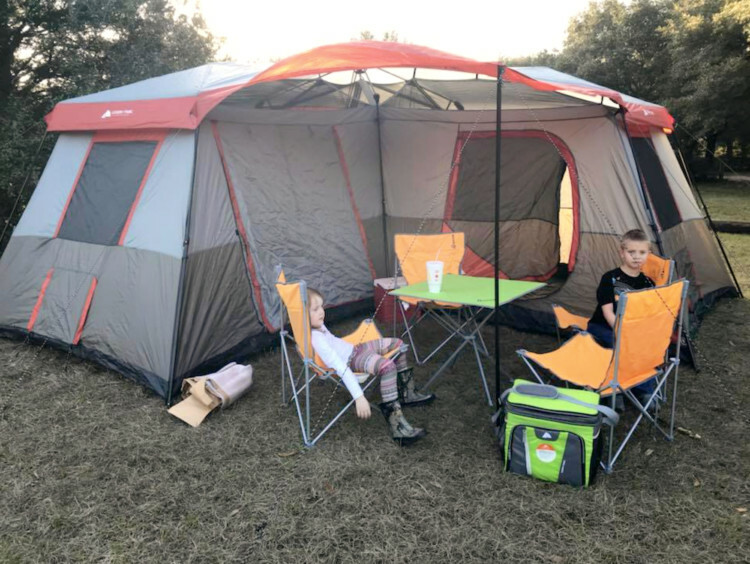 Our Traveling Moms have tried everything from tenting to cabins to luxurious “glamping.” Whatever option you choose, we’ve got camping tips to help make your first time camping trip a success. Researchers are finding that children today lack the experience of being outdoors and actually getting dirty looking for bugs or feeling tired after a long hike. The advantages of going camping with your family outweighs the small inconveniences you might encounter. 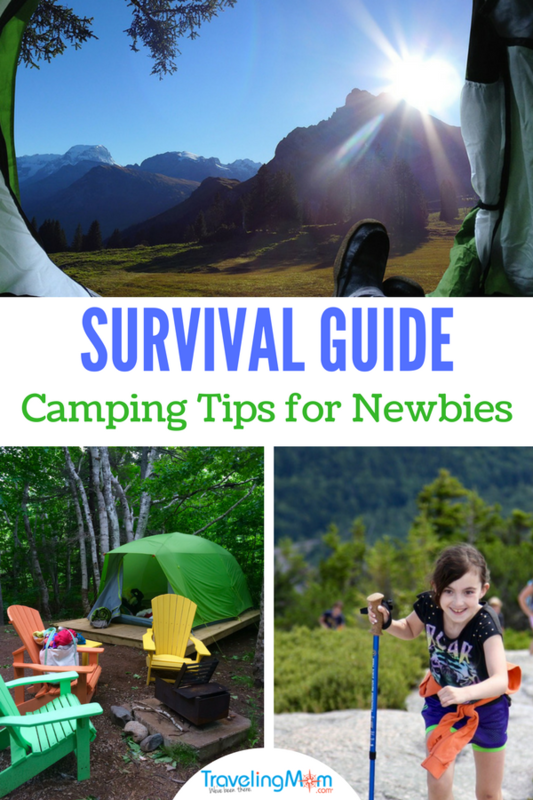 If you are new to camping, we’ve got essential camping tips just for you! My top camping tip is to challenge your family to remain unplugged from electronic gadgets. While many campgrounds provide electricity, remind your kids that the pioneers survived without cell phones. One TravelingMom simply said, “I think there is a rule that you aren’t allowed to use video games or cell phones in National Parks, so we’ll leave them at home.” The Kaiser Foundation reported that children spend 53 hours a week connected to some sort of electronic media. Camping helps you use that time being connected face to face with your children. Don’t build up the camping trip so it matches a trip to Disney World. Explain you are having a new family experience that involves going to a campground, taking hikes and of course, making s’mores. Prepare for bumps in the road. Bring board games and coloring books in case of rain. Scope out nearby grocery stores and restaurants. You may want to take a break from campfire cooking. Let your kids know that it’s going to be an adventure with ups and downs, and it will definitely be memorable. Choosing the right destination is the first step toward a successful camping trip. Does your like to swim, hike, bird watch, mountain bike? Keep your favorite activities in mind when selecting your location. I personally recommend finding a campground near water. Kids of all ages love access to swimming, skipping rocks, rafting, etc. One of our fondest camping memories is along a lake in Canada. We kayaked and jumped off rocks into the crystal clear water. 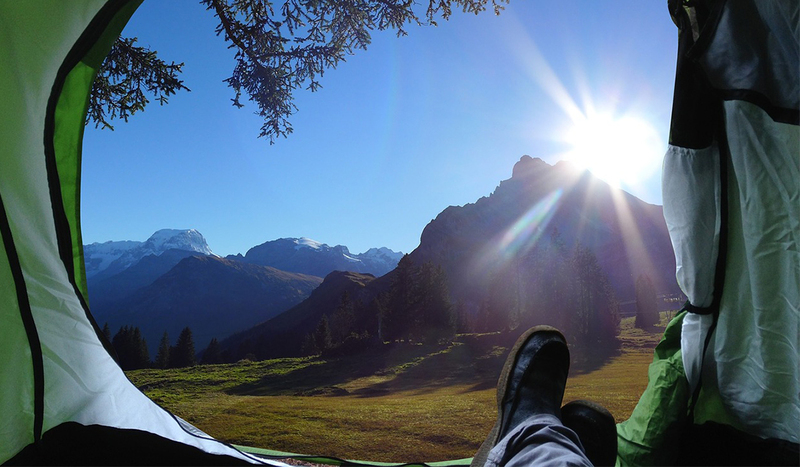 Camping Hacks: Our number one camping tip is to book early. Especially in the summer, popular campgrounds can book up months, even a year in advance. Another camping tip is that you don’t need to go far. Kids won’t be able to tell the difference if you go to a campground around the corner or 200 miles away. They want to get there, check out the pool or lake, ride their bikes, etc. If something goes terribly wrong, you’ll be close to home too. Not everyone is cut out for tent camping. Consider what sort of shelter is right for you. 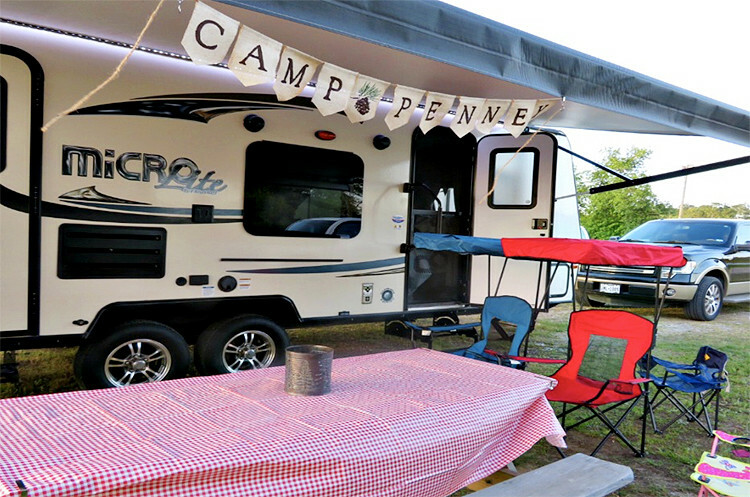 Many campgrounds offer options to rent cabins, RVs, “Glamping” tents and even cowboy wagons. Our TravelingMoms have tried them all. True old fashions tenting is the way to go for the most adventurous and rustic experience. Keep in mind that you will need to pack EVERYTHING from sleeping bags, pads, camping stove, lanterns, etc. Also be sure to select a tent that is big enough for your family. For example, a tent may say it’s made for 4, but that’s sleeping shoulder-to-shoulder with no extra room for anything else. Camping hacks: Practice setting up your tent in your backyard. When you arrive at your campsite, the last thing you want is to struggle to set up a tent you’ve never used before. Be sure to pack a rain tarp if your tent does not have one of its own. Consider a packable gazebo to place over the picnic table to protect food and keep bugs away. Not quite sure a completely rustic experience is right for you? Find a campground with pre-set tents. We’ve rented “Huttopias.” Popular in Europe and Canada, they are enormous canvas tents with comfortable mattresses, indoor seating, electricity, refrigerators, an indoor/outdoor kitchen and more. 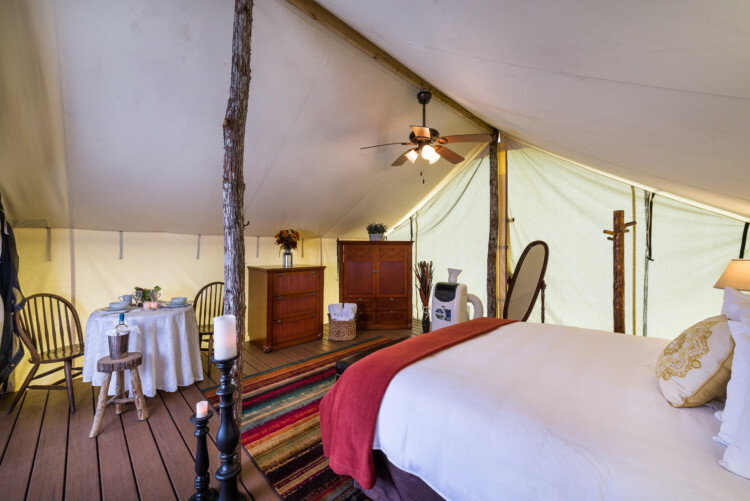 “Glamping” tents can be as glamorous as a top quality hotel room. Would you call this camping? No way! I might leave the kids behind for this option. Camping Hacks: Where’s the bathroom? keep in mind that these options do not usually have bathrooms. Often there is a shared bathroom and shower station close by. You’ll most likely need to bring all of your own toiletries. When booking, also ask if you need to bring any kitchen utensils. Many campgrounds offer rental cabins. This means you’ll have actual beds and a solid roof in case of bad weather. Some are quite rustic without bathrooms or linens. Some have most of the comforts of home including kitchens, bathrooms and outdoor grills. If you are on a tight budget, rustic cabins will be your cheapest option. 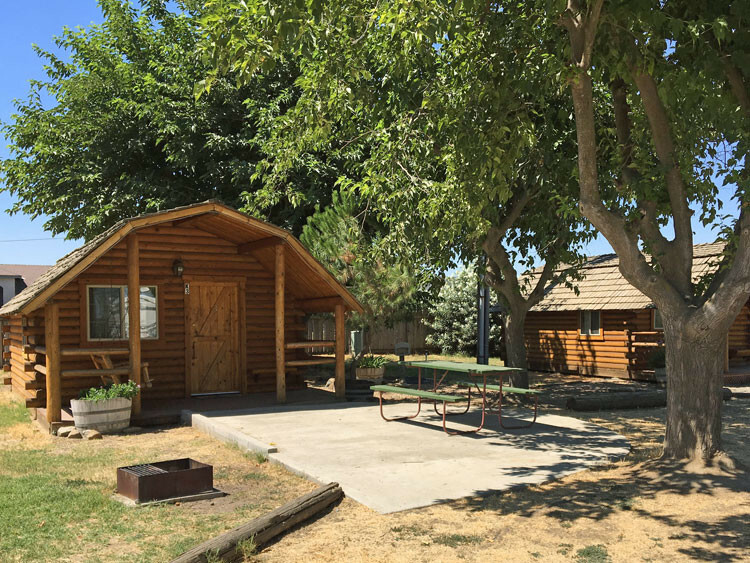 Cabins are available at most KOAs if you aren’t RV or tent camping. Photo: Shannon Entin / Roadschooling TravelingMom. Camping Hacks: Always double check what is provided. Things like linens, cooking supplies, air conditioning, etc. Whatever will make your family most comfortable. Find out if there are any family activities for campers. It’s a great way to keep kids from getting bored. When we stayed at a KOA campground in Maine, there was bingo night, ice cream sundae night and crafts like candle making and painting. 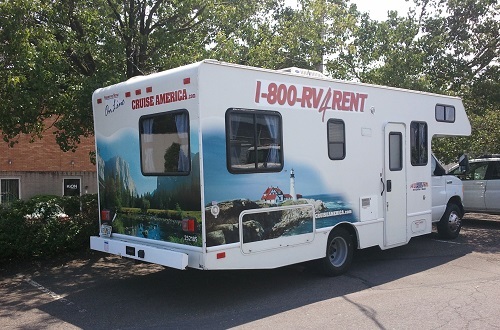 While you can rent your own to drive or tow, some campgrounds offer these to rent on sight. Our kids really got a kick out of a pop-up camper we used in Canada. These offer small kitchens, bathrooms and sleeping quarters. Ask if cooking accessories are included. You don’t want to arrive and realize you have nothing to cook with. If you rent your own, the novelty of having a house on wheels makes the trip extra special. Camping Hacks: A string of outdoor lights makes night time dining festive. And don’t forget this camping tip: You’ll need a parking pad that fits your RVs size and has appropriate hookups for electricity and waste disposal. If you want something completely different, you can find tree houses, cowboy wagons, yurts and more. Our kids thought a yurt, a circular prefab structure was totally awesome! Renting a treehouse is next on our list. 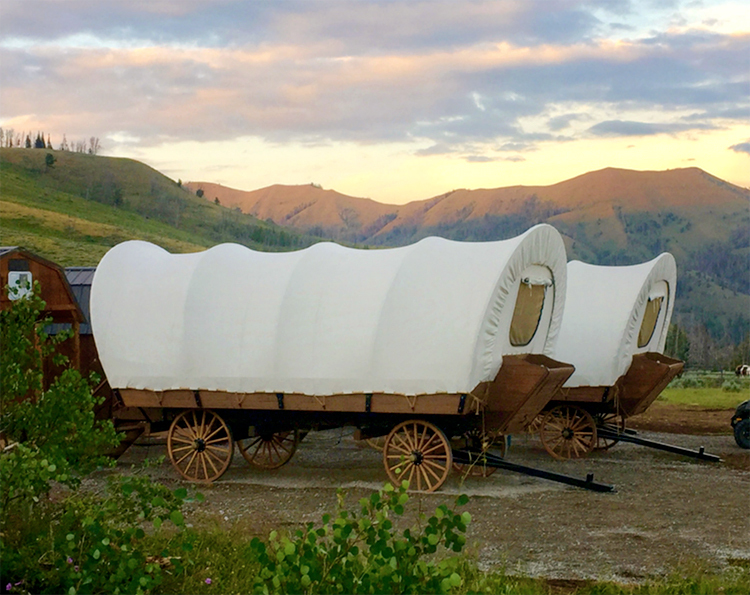 TravelingMom Sherry Boswell and her family slept in a covered wagon. How’s that for unique? Of all family vacations, camping is likely to have more unexpected challenges. It’s important to be prepared for the unexpected. Even if you check the weather just before you depart, it’s always a good idea to be prepared with rain gear and extra layers. Have a backup plan for rainy days. We pack nature journals, books and board games for indoor entertainment. For outdoor exploration, we create scavenger hunts, go on hikes and find ranger-lead activities if we are near national parks. Also be ready for sun with plenty of sunscreen, sunglasses and sun hats. Always keep safety in mind when camping. Leave notice with friends or family about where you are going, especially if you are going to be “off the grid.” Notify a ranger station when you take a long hike. Be aware of the natural hazards in the area. Ask where to seek shelter in case of storms or fires. Check if you have cell service where you are staying. Where bug spray and always check for ticks each day. A bit of preparation goes a long way when it comes to mealtime. Try to plan each meal in advance and even do some prep work ahead of time. Make sure you have all the ingredients you need. Don’t forget things like salt, pepper, and any condiments your family likes. Also keep in mind the tools you might need like can openers, spatulas, cooking knives, corkscrews, etc. If you don’t want to pack all of your food, consider a campground that is not too far from a town with a grocery store. 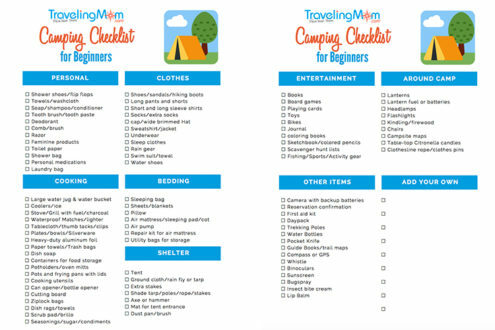 Your packing list will vary depending on the style of camping you choose. We’ve created a packing list starting from scratch. Simply cross out what you don’t need or use our template to create your own list. Richard Louv, author of Last Child in the Woods, coined the phrase, “Nature Deficit Disorder” relating to children who don’t have any connection to nature. So get adventurous and head out to a campground where you and your family can wade in streams, gaze at stars and of course, make those s’mores! I also love this quote from Credit Card TravelingMom, Yvonne Jasinski, “We go because being close to nature is healing and because memories created during camping trips are priceless.” She’s got some great additional camping tips. Author’s note: This is an updated version of a post originally written by Silvana Clark.